“Ugh”. That’s the first thing that comes to mind.“Don’t judge a book by it’s cover.” The first two covers gave you a pretty good idea of what you’d expect (the conflict, the villains, a dramatic situation) this one…not so much. Instead they use the cover as a means to focus on their NEW costumes, the FANTASTI-CAR, and secret SKYSCRAPER HIDE-OUT! When I first saw the cover, I wasn’t super excited, but I pushed forward. 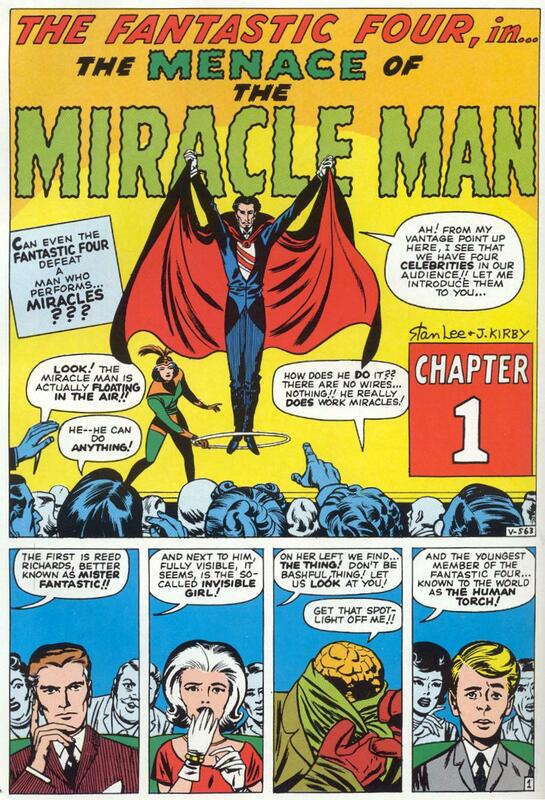 Page one shows us the villain of this Fantasti-venture: The Miracle Man. No wonder he didn’t make the cover – he doesn’t even look intimidating, and he does very little within the story to convince me otherwise. As it progresses, we discover that he’s a disgruntled magician who wants to take over the world. After the Fan Four go to see his performance, and he makes them look like fools, he decides it’s the perfect time to strike. The Miracle Man uses his powers to make all sorts of craziness. He even turns a fake stand-up monster into a full-fledged city destroying monster – kind of like the Stay Puff’t Marshmallow Man in Ghostbusters. At the end of it all, he seems invincible, but eventually gets taken out when the Human Torch blinds him with a flash. They capture the Miracle Man and discover his secret: he actually didn’t perform ANY of the supposed feats. Instead, he was able to hypnotize those around him into believing they saw what they did. …Hypnotism? AGAIN? I feel a little let down at this point because it’s almost as though hypnosis is the go-to Fantastic Four deus ex machina. Well, enough about that. It’s time to talk about the REAL highlight of the story. That’s right! 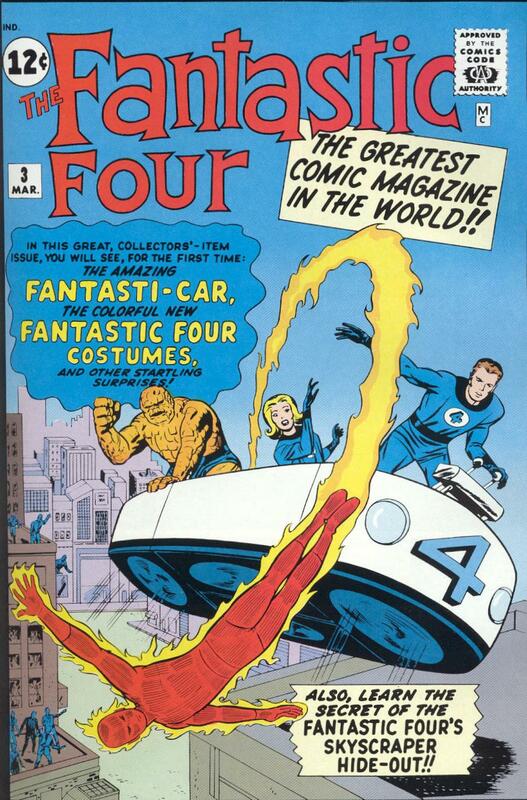 What about the Fantasti-Car, the Fantastic Four Costumes, and the Fantastic Four’s Skyscraper Hide-Out?! It’s basically a hover couch that is split into four sections. If needed, it breaks apart so that they can hover independently. I can’t wait to see how long they use this vehicle, because it offers no protection, no maneuverability, and it looks ridiculous. These are the iconic costumes that everyone knows and loves. In my opinion they still look cool today. You get a sense that this family is slowly developing into heroes, and it was a brilliant move to not put them in costumes in the first two adventures. The costumes are introduced with Susan Storm telling the guys that she made them all costumes – and The Thing throws a FIT! Sue even made a helmet specifically for him, which is pretty hilarious since I’ve never seen him with a helmet. He kind of just stands there while she puts it on him (sort of like when you see an animal in a sweater, you know they hate it, but it’s funny). My favorite part of this issue comes during the climax. 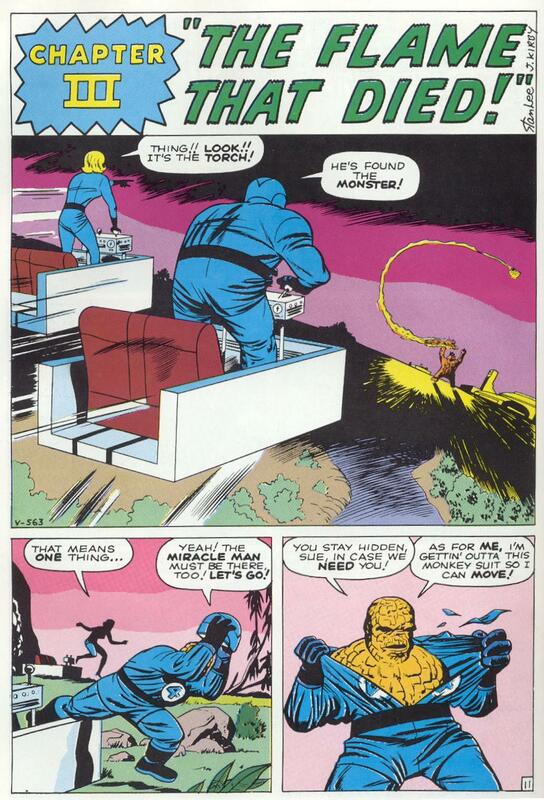 Preparing to fight Miracle Man’s monster, the Thing immediately rips his costume off. That costume of his lasted about 10 minutes or so. Eat your heart out, Hulkamaniacs! 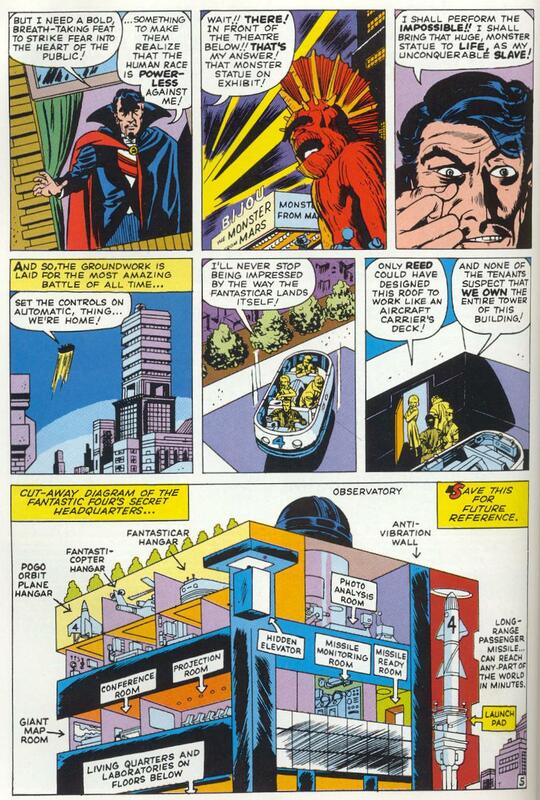 Finally, we have the Fantastic Four hide-out, which is shown as a side profile cutaway. It looks like something I would have drawn as a kid – and seems to have everything but the kitchen sink. Sadly, that’s really all we see of it. The rest of the story just shows them walking around an apartment, with nothing dramatic going on. It even says, “Save This For Future Reference” next to the diagram, but never really gives us the need to refer back to it (let alone the fact that they update the drawing with a new diagram a few issues later). They really are super-heroes now though, and maybe that’s what this issue gives us. 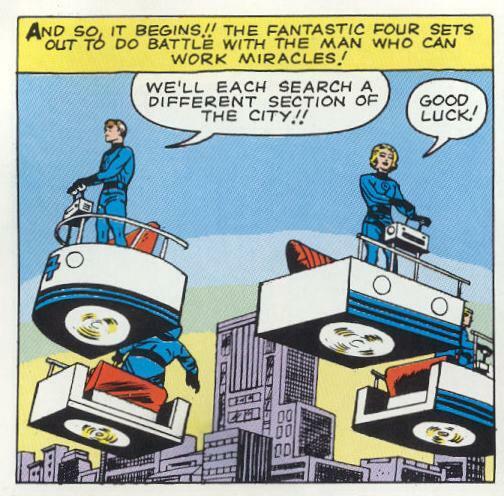 They patrol the city from their flying couch, and even have a gigantic building (complete with a missile silo?). The city is starting to look at them like celebrities now, and that’s an interesting turn. It makes them stand-out amongst other heroes of that time. I wonder what negative effects we’ll see from that? The story ends on a downer though. The Thing is PISSED at Johnny, the Human Torch. It’s actually just a little bit of jealousy because Johnny was the one who defeated the Miracle Man. They exchange some words, and the Human Torch leaves the group. Will he come back?! Stay tuned!! !